We can custom manufacture and install overhead and perimeter baseball netting and softball field netting. As a more economical solution rather than chain wire fencing, netting provides a higher level of safety from ‘stray’ balls, as well as easy ball retrieval during the game. Buy direct from our factory in Port Melbourne. Oxley Nets offers custom designed and installed baseball netting to suit baseball fields, or baseball and softball practice facilities of any configuration. 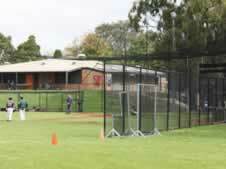 For baseball and softball fields, we can provide overhead and perimeter netting as crowd safety nets. We can start by assisting with the design of your baseball netting for the field, and we can engineer, manufacture and install all the support poles required, as well as install all the rigging and netting as required. For indoor baseball practice, we can provide fixed or retractable divider nets, backnets, and roof nets to suit any building. The Victorian State Baseball Centre in Altona, and the baseball NSW facility in Blacktown are just some of our baseball netting projects.